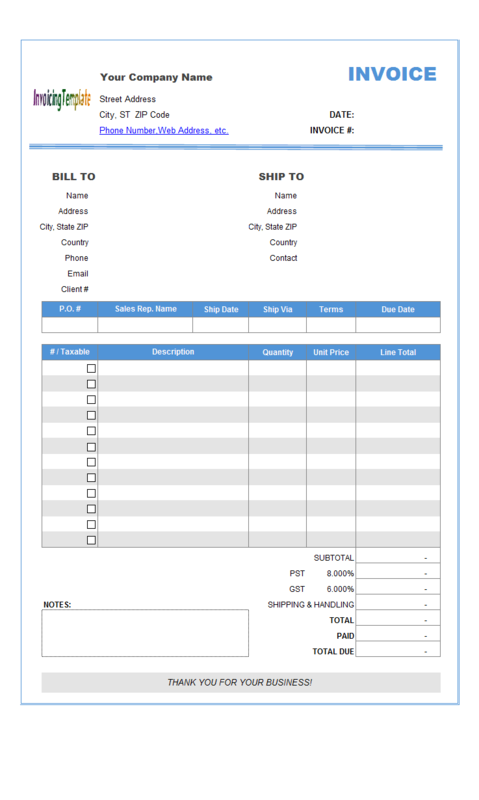 This is the standard (default) invoice template shipped with Invoice Manager for Excel (namely Uniform Invoice Software) installer program but with double-border added. This sample template also demonstrates how to add row, column to an existing form and redefine the printable area. 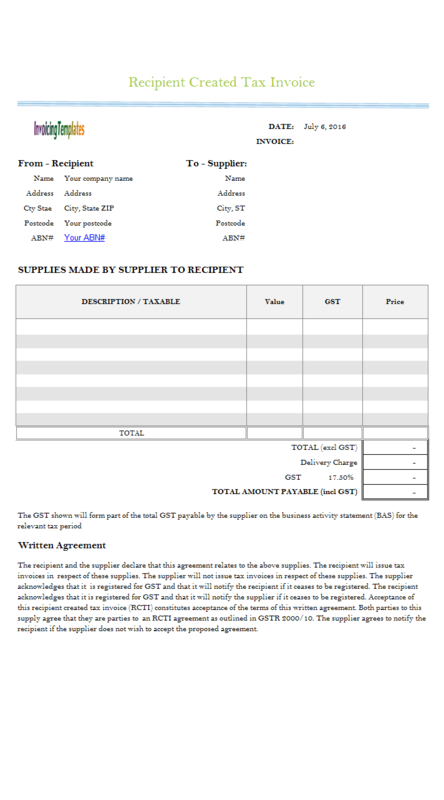 c5085 now includes the customized invoice template for the latest version of Invoice Manager for Excel. 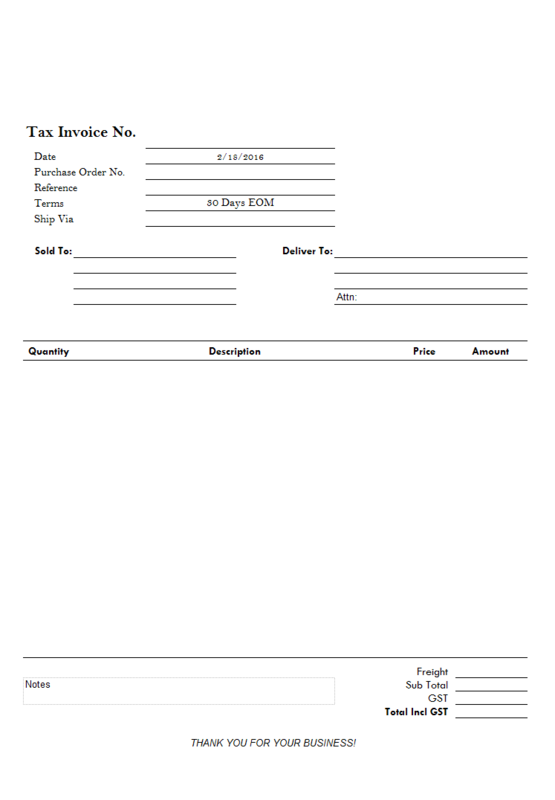 This is what you will see when you open standard-invoice-template-double-border.xlsx. 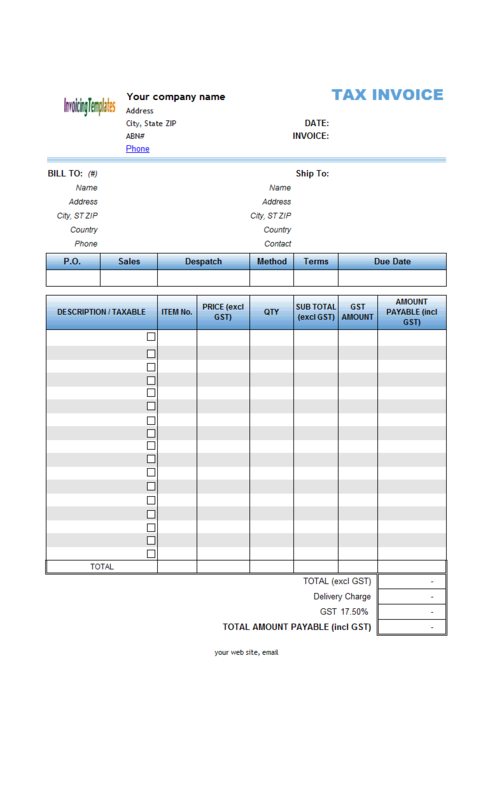 Here by the word "standard" we mean the default invoice template shipped with Invoice Manager for Excel (namely Uniform Invoice Software). 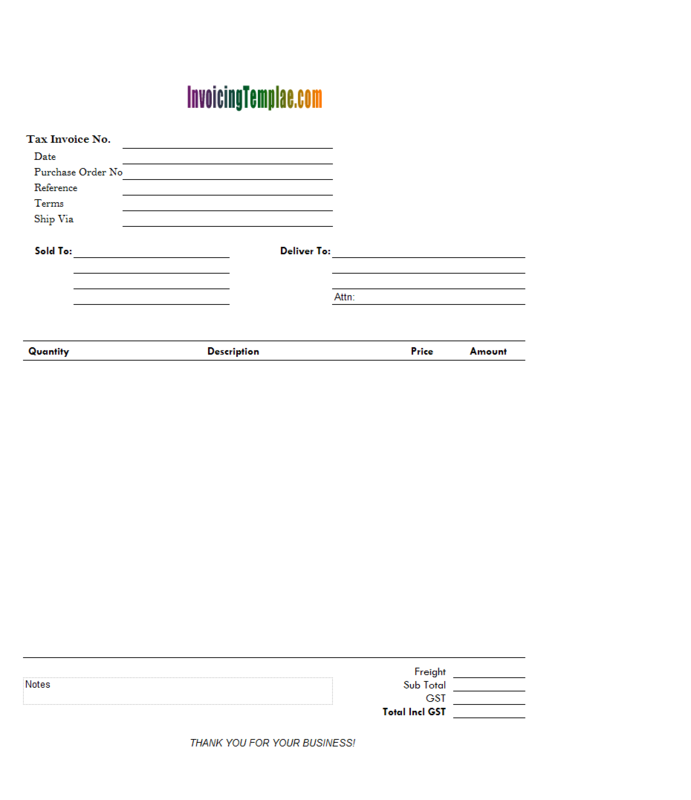 All the invoice templates here on InvoicingTemplate.com are variants of the standard invoice template. 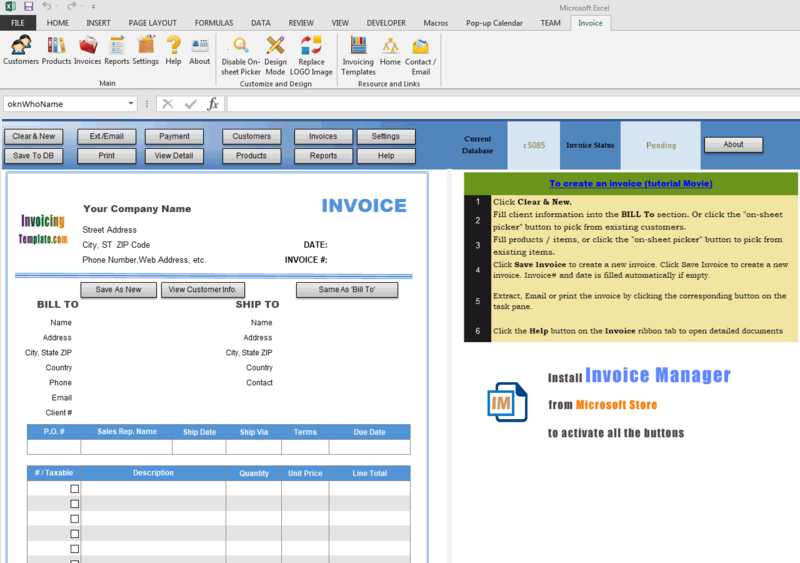 As long as you adhere to the rules defined in Customizing Invoicing Templates, the result template will work with Invoice Manager for Excel (namely Uniform Invoice Software). That means Invoice Manager for Excel (namely Uniform Invoice Software) is able to provide all the powerful functionalities such as the search bar for locating customers, products and invoices, reporting worksheets, etc. 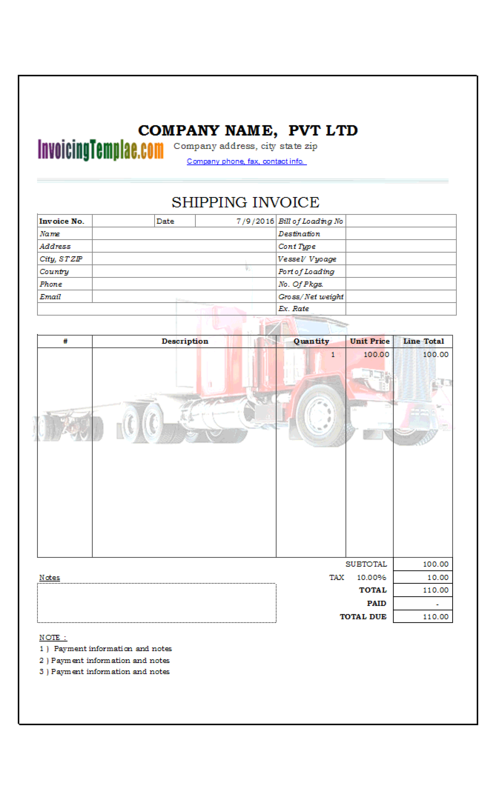 Here we look at how to add a double border surrounding the entire printable invoice form. Step 1: Before doing our customizing job, first you have to back up the template. Step 2: Open the template as usual. 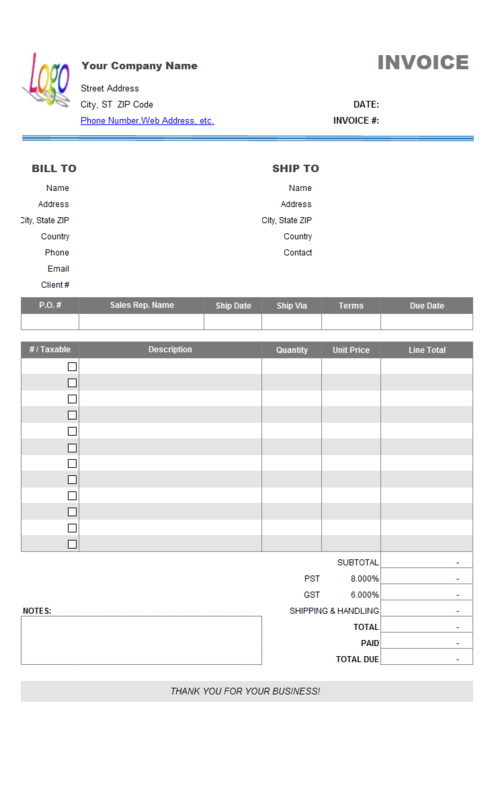 Click the "Design Mode" button on the "Invoice" ribbon tab. 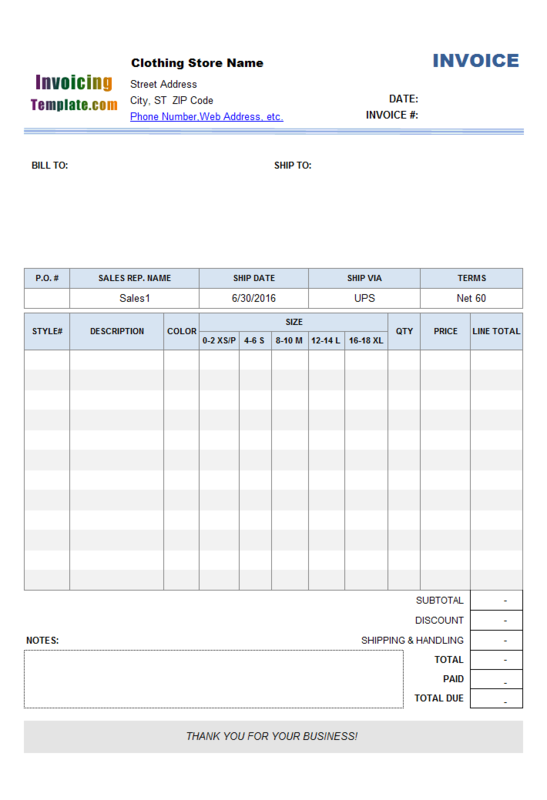 Step 3: Add one row to the top, one row to the bottom, one column to the left edge and another column to the right edge of the printable invoice template. For example, to add a row to the top of the printable form, you need to do the following steps. 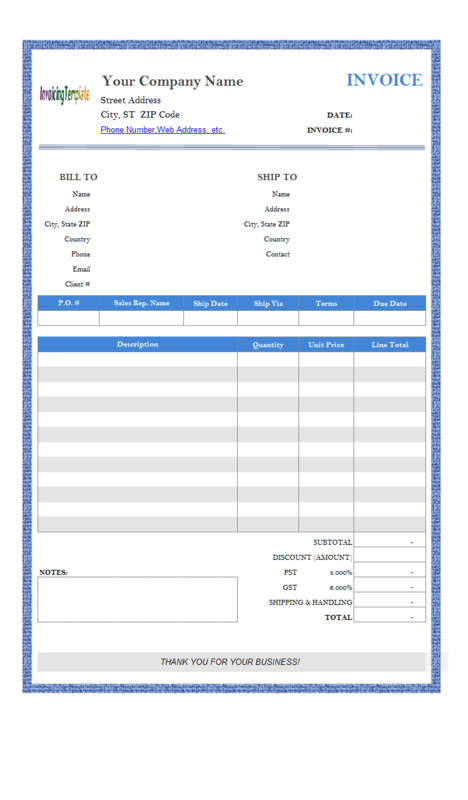 Make sure the "Invoice" worksheet is the active sheet. Click the "Down arrow" button on the name box located on the left side of the formula bar. Excel shows all the names in a drop down list. Scroll the drop down list till bottom. Click and select "Print_Area" from the list. Excel selects the cells that defined by the "Print_Area" name - this is the printable form that will be printed when you issue the "Print" command, or will be extracted when you click the "Extract/Email" button. 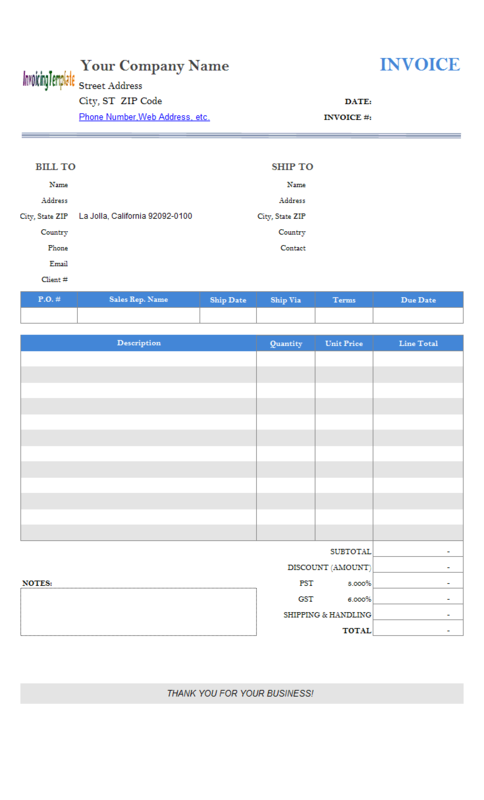 When generating PDF invoices, the printable area defined by the "Print_Area" will also be respected. Right-click the heading of the first row on the printable area. Choose "Insert". This adds one row above the top of the current printable area. To add a column to the left of the first column of the printable area, right-click the heading of the first column of the printable area, and then choose "Insert" from the shortcut menu. You can add new row / column to the bottom, right edge of printable form, or skip this procedure since the right and bottom direction already have empty columns / rows there. Step 4: Drag your mouse to select all the range for the new printable form - this is the area that has one row / column expanded to the top, bottom, left, right edge of the original printable form. In this sample, we selected the area addressed at $C$2:$L$48. Now go to Excel "Page Layout" ribbon tab and from the "Page Setup" group, click "Print Area" and then "Set Print Area". This defines our new print area. Step 5: Add left-border to the left-most column. Drag your mouse to select the entire new "Print_Area". In this sample, it is $C$2:$L$48. Tip: you can just the the "Print_Area" name from the name box on the formula bar. Right-click one of the select cell and choose "Format Cells". Go to the "Border" tab. From the "Style" list, choose the double-border style. In the "Border" section, click the borders respectively. Click OK to close the "Format Cells" dialog box. Step 6: Adjust the height of the newly added rows, adjust width of the newly added columns, to make proper margins between the borders and actual content. Tip: You can click Excel menu File / Print. This shows the print preview of the current print area. Here you can change the column widths by dragging and dropping. Make sure to leave proper spaces between the double-border lines and actual content, and proper space between double-border lines and paper margins. 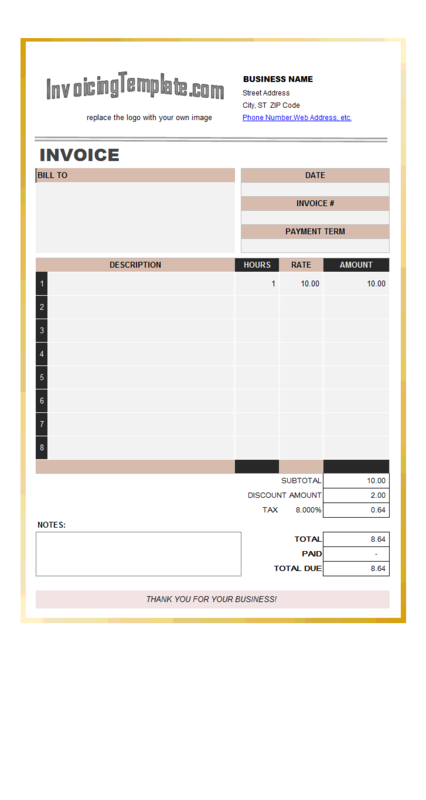 Once you have done the fine-tunes, exit design mode by clicking the "Design Mode" button on the "Invoice" ribbon tab. Click Save command on Excel quick access toolbar to persist the customizations. 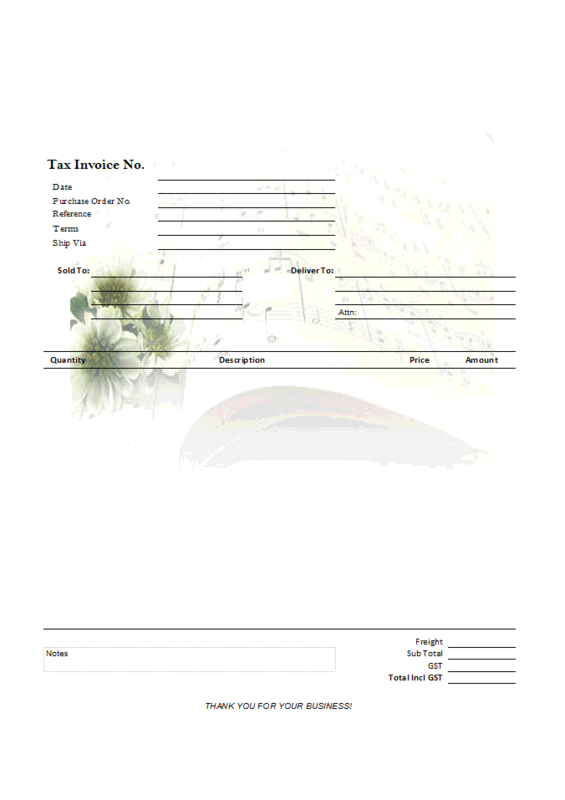 Like other form designs here on InvoicingTemplate.com, Standard Invoice Format with Double Border is free (offered to you at a price of 0.00USD). It works on Windows XP and all newer versions of Windows, and Excel 2007, 2010, 2013 or 2016.